Saying goodbye to Astrid tomorrow. Ian, her new owner, and his son will be sailing her from Netley Sailing Club to Ashlett Creek, on the other side of Southampton Water, to meet up with other Dinghy Cruising Association members and camp overnight. 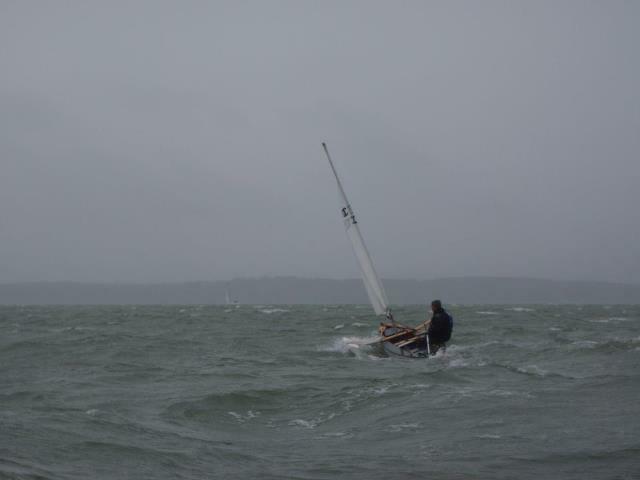 Here’s a photo of Astrid and I sailing across the Solent in February last year. Astrid and I sailing across the Solent in February last year. Gusting up to 28 knots, 8 degrees and it rained all day, but it was great sailing and gave me enough confidence in myself and Solway Dory’s sailing canoes to think of something more ambitious. Astrid will be going to a good home. Seems strange to become so attached to a boat but maybe it comes from what feels like shared experience and memories. And also all the accumulated trust in the boat to help keep me safe when sailing to remote places or alone in rough seas. Ian was due to sail Astrid to Ashlett Creek but he was running late, so I rigged Astrid for the last time and thought of the places we’d sailed to over the last four years.